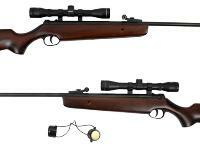 The Hammerli 490 Express is the ideal break barrel air rifle if you're looking for accuracy, value, and reliability. 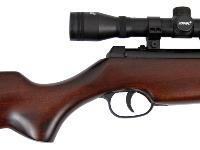 Features include: automatic safety, semi-Monte Carlo hardwood stock, cheek piece, soft recoil pad, blued finish, low cocking effort, adjustable rear sight, hooded front sight, scope grooves with scope stop. 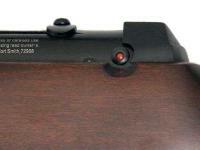 Includes a 4x32 scope. Check out the AMMO link for recommended pellets. 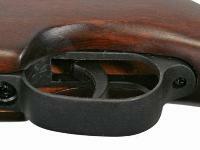 Remember to click on the ACCESSORIES link to select appropriate scopes, mounts and other shooting gear. Things I liked: Light weight and well balanced. Sights are excellent. Stock and metalwork are decent, once shipping protectant is removed: not a lot of plastic. 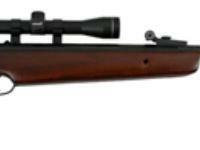 Scope is good enough for the price, but you probably won't want to use it, since the sights are so good at the ranges this rifle is good for. Cocking effort is non-existent. Trigger is crisp, but pretty stiff. Things I would have changed: Breech block pivot adjustment is too coarse, although lock-up is tight. Trigger is a little stiff unless lubed frequently. Automatic safety works great, but seems to be on the wrong side and in an awkward position for me. What others should know: This is a great little rifle -- 500fps is good for fun with targets out to about 20m and it will whack targets pretty solidly. Does seem to require chamber lubrication (not much worry about detonation with this one) more often than you might expect. LOP is just right for average sized person, especially if you are wearing more than one layer of clothes, such as in colder weather. 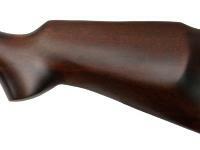 Things I liked: Quiet, easy to shoot, light cocking force required, decent sights and stock for a gun of this price. You can shoot for a long time without tiring. It's so fun to shoot with the sights, I haven't mounted the scope yet. What others should know: Directions for adjusting the windage in the manual are backwards (It was frustrating, especially since I hardly ever read manuals.) The scope mounting instructions are really weak. Look at the close-up photos to see exactly where it goes. 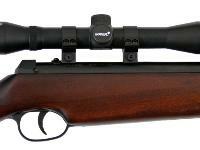 Hammerli 490 Express Combo, 4x32 Scope.